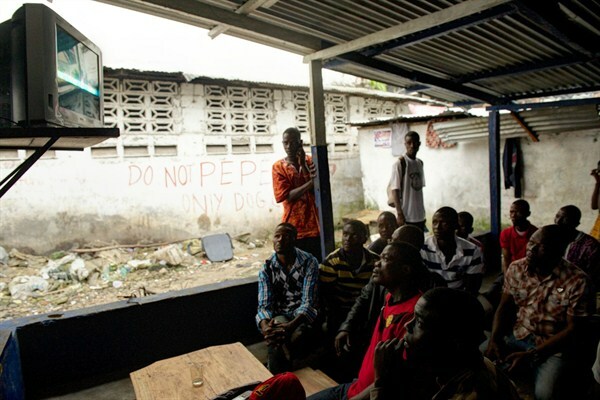 Men watch the announcement of a ruling on an appeal bid by former Liberian President Charles Taylor, Monrovia, Liberia, Sept. 26, 2013 (AP photo by Mark Darrough). On June 2, authorities in the U.K. charged Agnes Reeves Taylor, the ex-wife of former Liberian President Charles Taylor, with torture in connection with crimes she allegedly committed during the West African nation’s prolonged period of civil conflict. The arrest makes Reeves Taylor the latest in a series of high-profile Liberians to be arrested in Europe and the United States in recent years. In Liberia, meanwhile, there has been no progress on justice initiatives under President Ellen Johnson Sirleaf. Charles Taylor is serving a 50-year sentence in the U.K. for war crimes and crimes against humanity, but his trial dealt with his involvement in the civil war in neighboring Sierra Leone. In an email interview, Aaron Weah, a Liberian researcher who is currently the country representative for Search for Common Ground, discusses how the recent arrests are being received locally. The views expressed here are his alone and do not reflect those of Search for Common Ground.